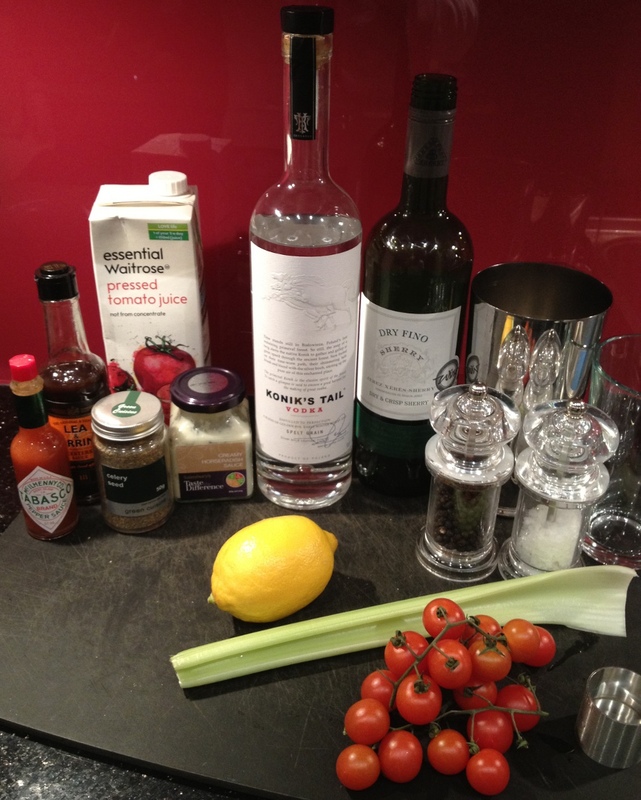 My favourite thing about the famous ‘Bloody Mary’ cocktail is the seemingly endless variations on such a simple theme. Who would imagine that two liquids as humble as tomato juice and vodka, when mixed with a few of the right supplements, could end up tasting so good? Alex and I went about trying to determine the perfect Bloody Mary, drawing on various recipes and personal experiences. The experiments, as always, were clinical and highly scientific; to pick out our favourite combination of flavours we added various juices, alcohols, spices and sauces to individual shot glasses each with an equal amount of tomato juice. 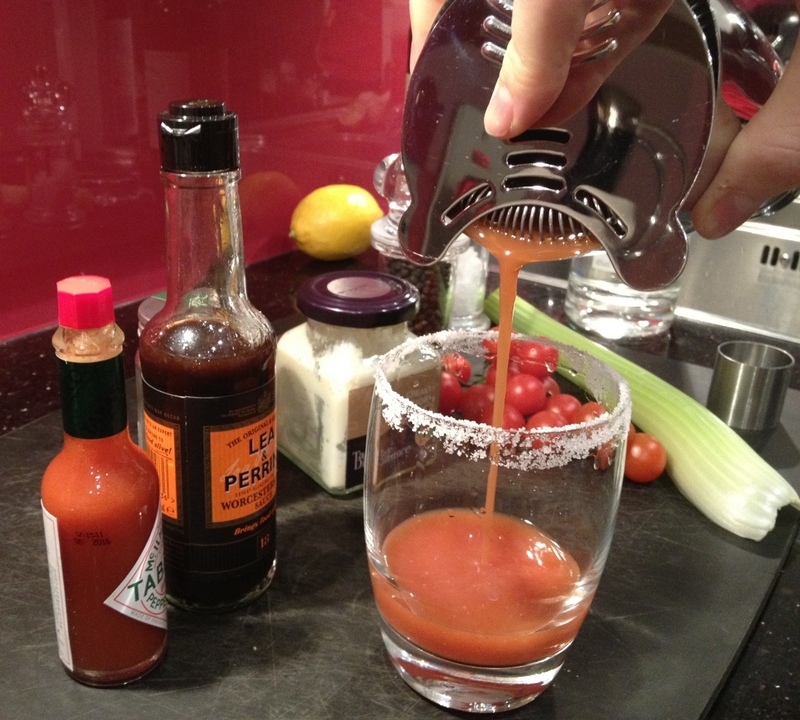 Among the Bloody Mary’s that didn’t quite make it to my ‘perfect’ cocktail were some great runners up… you could try yours with perhaps a squirt of HP sauce, a dash of orange juice, or try using Clamato Juice, an American clam-flavoured tomato juice. 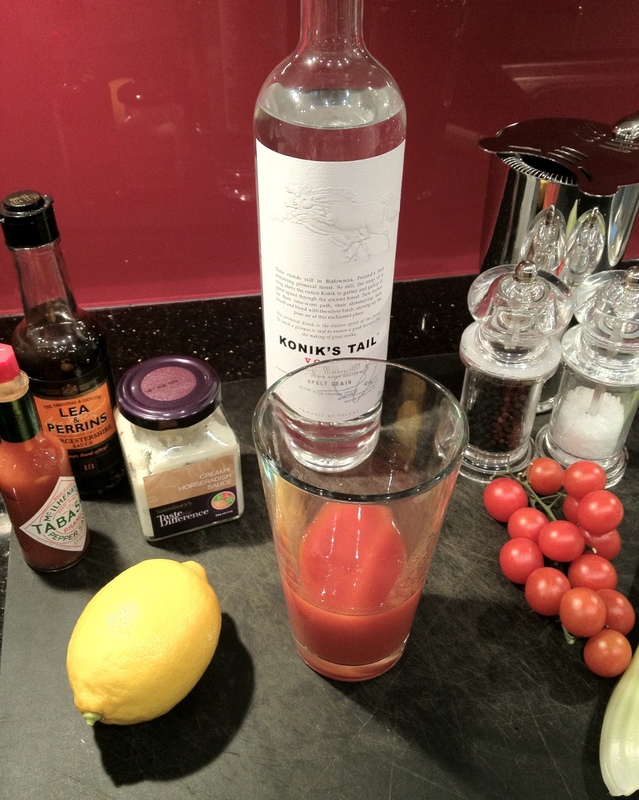 Anyway, here it is, after much debate and serious tasting, using a delicious small batch vodka and a few simple ingredients my perfect Bloody Mary! Rich, spicy and nutritious! Pour four shots of tomato juice and one and a half shots of vodka into the Boston Glass. 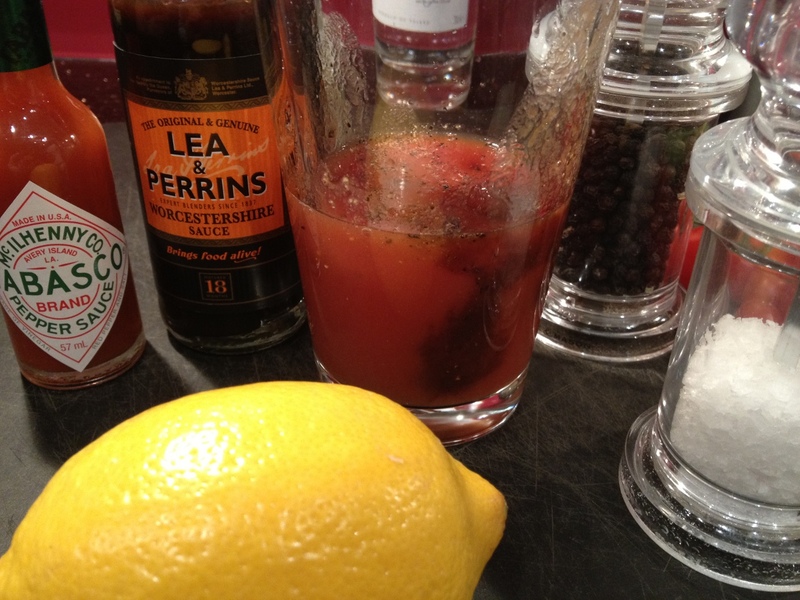 Add in half a shot of Sherry, half a shot of Lemon Juice, four shots of Tomato Juice, ten dashes of Worcestershire Sauce, four drops of Tabasco Sauce, a quarter teaspoon of Horseradish sauce, one pinch of Celery Seeds, two pinches of pepper and a pinch of salt. Add ice and shake briefly until cold, be careful not to over shake. 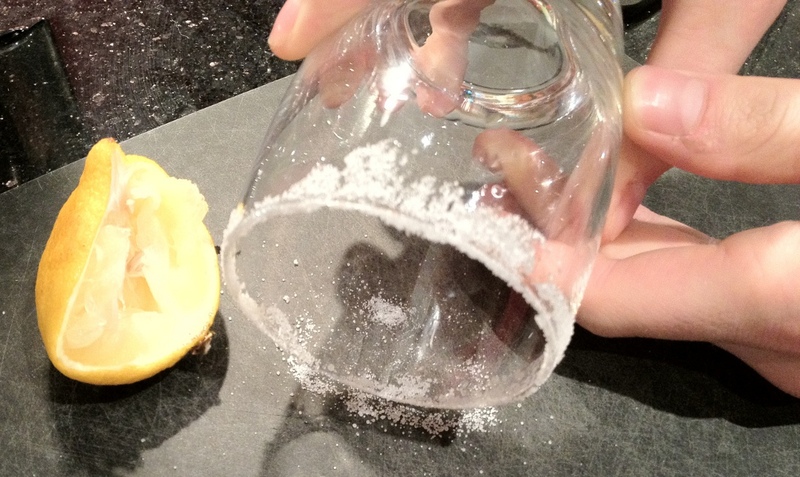 To salt the rim, first smear lemon juice on to the rim of the glass. Add fine salt to a chopping board. Then slowly and carefully roll the rim of the glass in the salt. Pour the shaken cocktail into the salted glass. 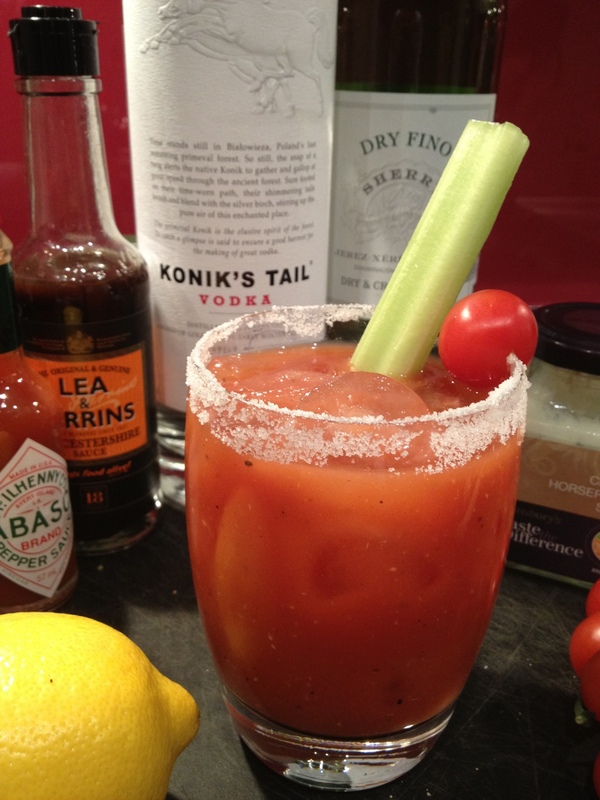 Then place ice in the glass and garnish with a celery stick and a cherry tomato.